The company FleiKa Maschinen und Anlagenbau GmbH & Co KG is a privately owned medium-sized family business engineering machinery and plants. 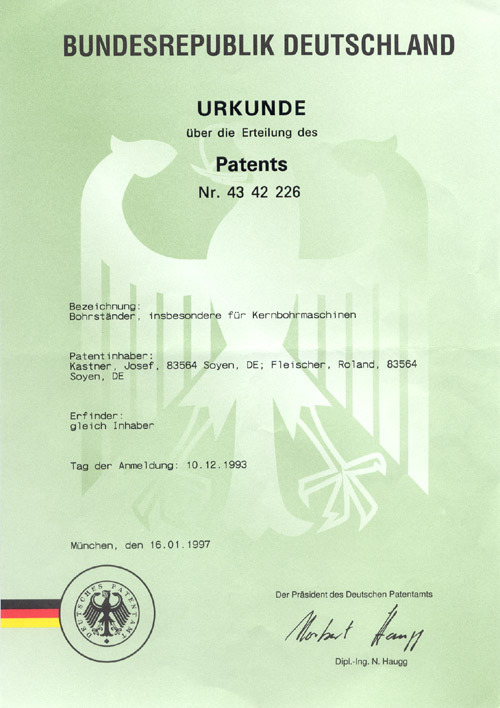 After many years of experience in the field of concrete processing by means of diamond tools and machines, Mr Kastner developed an innovative roller guide system for core drill stand, for which he was granted patent protection in 1997. In 1995, Mr. Kastner decided to terminate his drilling and sawing business and to found the company FleiKa Maschinen und Anlagenbau GmbH & Co KG. Mr. Kastner has over 20 years of practical experience as a self-employed concrete driller, constructor and manufacturer of drill stands that are invented and constructed as remarkable and work simplifying parts in time-consuming development work. The head of the company himself guarantees, though his daily work, that his stands are advanced products of unique quality. New ideas for the improvement of the stands are immediately implemented and integrated into the plants. The family ensures a high level of service and continuity.